THE REAL story about Jared Remy appears to be “roid rage” — the tragic effects of steroid abuse on the user, his family and friends, and other victims. The road to recovery is a long one that depends upon the intervention of trained medical professionals, hospitalization, and follow-up care until the user’s system has been purged of all chemical and psychological dependence. My son was fortunate to have recovered from the nightmare of steroid abuse, and not to have committed suicide, as a schoolmate did, nor to have inflicted pain on anyone else. However, until that happened, he often vacillated between Jekyll and Hyde while I, like Jerry Remy, tried to do everything I could to help my son. Jared Remy Was Arrested 19 Times. Judges Kept Letting Him Off. Then He Allegedly Murdered His Girlfriend. 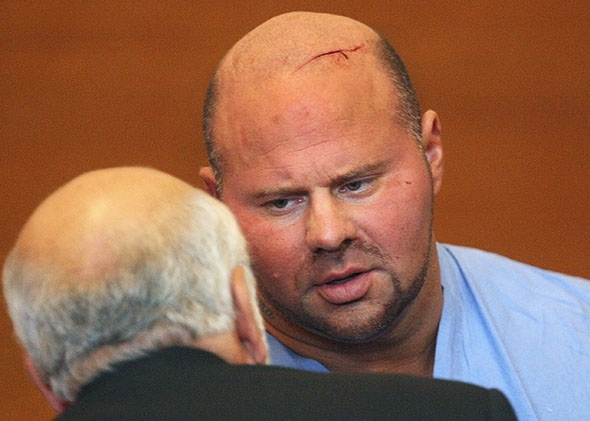 By the time Jared Remy of Waltham, Mass., was arrested for allegedly stabbing Jennifer Martel, his girlfriend and mother of his daughter, to death, he had been a criminal defendant 19 separate times, mostly for beating or stalking various girlfriends. Despite being a familiar face in courtrooms from the age of 17 to 35, Remy—son of Jerry Remy, a local legend in Boston for his long career with the Red Sox, first as a player and then as a beloved sports broadcaster—never really paid for his crimes. Why was such a dangerous, uncontrollable man—who abused the women he dated, the men who dared be around them, and steroids—able to escape justice for so long until he allegedly committed a crime so terrible—stabbing a woman to death in front of neighbors and friends—that his violence has finally become impossible to ignore? But Remy didn’t just benefit from his family’s privilege. He also benefited from choosing his targets wisely. Most of Remy’s alleged victims are girlfriends and ex-girlfriends, and there are still a lot of cultural barriers that make it hard for the justice system to treat domestic violence with the same gravity applied to other kinds of violence. Some of Remy’s girlfriends refused to testify or, in a few cases, actually testified on his behalf after buying his story that he was sorry and would change. Judges seemed to agree with Remy’s defense that a case was overblown or that he meant it when he said he would stop bothering these women. Parental interventions, such as letting Remy move home or securing him a job at Fenway Park, helped convince judges that he was finally shaping up and would no longer be a danger. Over and over again. It was a perfect storm of wealth, privilege, and interpersonal loyalty that made it impossible for prosecutors to get any of the various charges they threw at Remy to stick. Last August, after Jared Remy allegedly assaulted Martel, slamming her against a bathroom mirror, Martel spent the night at Hill’s apartment next door. Hill said she encouraged Martel to go to court the next morning to extend an emergency restraining order against Remy. But Martel told her that she had promised the Remys she would stay home, Hill said. In his statement, Jerry Remy said the family did not discourage Martel in any way from extending the restraining order. Whatever the reason, Martel did not go to court, and Jared was released. Prosecutors later acknowledged they put too much stock in Martel’s absence. The next night, she was dead. Reading Moskowitz’s piece is an infuriating and depressing experience, and it’s easy to walk away with one simple thought: Jared Remy is a monster. But there’s so much more. Remy, who Moskowitz calls “the king of second chances,” was able to abuse so many victims without consequences for a variety of reasons: Wealthy, connected people tend to fare better in front of judges than everyone else, and domestic abusers tend to be able to convince their victims and their families that they didn’t mean it and that, if given a second (or 20th) chance, they will do better. The price of giving this man so many opportunities appears to be one dead woman and one motherless child. Now, we have to wait for his trial to see what price he will finally pay.